I was waiting to share this project until I was ready to show all my living room projects at once but I just couldn't wait anymore. Plus, it will be more fun to show them one at a time! When David and I were first married I had purchased an old 8 drawer dresser off Craigslist for $50 which we used as a TV stand. It was cute and had lots of storage but I got tired of it and ended up making a few dollars in a garage sale a year later. When we moved to San Diego we needed to get a new TV stand and it had to be tiny for our alloted space. After much searching we finally just bought a boring wood stand from Target. It was fine looking but I never liked it and it didn't hold even half of our movie collection. One of the first things I did when I found out we were moving was start looking for something to replace that stand. Within a couple of days, I had posted our old one on Craigslist, sold it for $80 and had started looking for something that was unique and could be a focal point in the room. 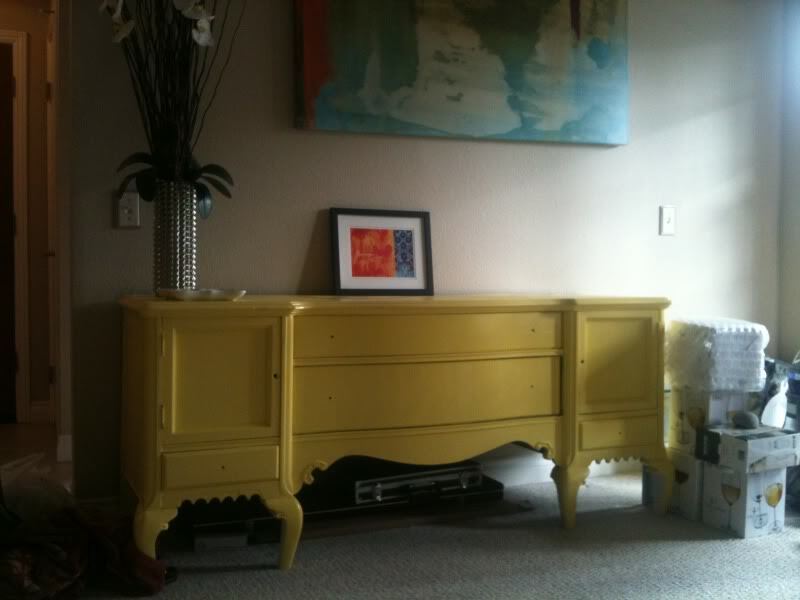 I immediately fell in love with this vintage sideboard that was for sale on Craigslist for a whopping $110! Those curvy lines, the deep cabinets and the lovely feet! I didn't think I would be lucky enough for it to still be for sale so I called up the owner and almost died when she said that she would sell it to me for $10 less than her asking price and that she'd store it at her house for us for a week while we moved. I was so, so happy. While I really appreciate the canary yellow she had painted it and think it's a cute color for a certain decor, it just didn't suit the rest of my furniture. There were two things "wrong" with this sideboard however. First and foremost, it was missing a back leg which made for a very wobbly piece of furniture and was certainly not strong enough to hold our beast of an ancient TV. Secondly, there were no knobs. I'm sorry I didn't take any pictures of each step but in case you're considering taking on a project like this, here are a few things we did. First, we needed to tackle the leg situation. David purchased a 2x2 piece of oak for the leg which he measured and cut to size. Luckily the front legs are the only decorative legs so a solid piece of wood matched the other side. This sideboard is quite old (we're guessing 1930's or 40's) and has been well-used, which was fine with me especially considering the price, so we knew we needed a really strong piece of wood. After cutting it to size he set it in place with Gorilla Glue. This is some crazy strong stuff, folks! It's holding up like a charm. Next up was painting. The previous owner told me that she had purchased it with a nice primer on it so it was ready for her to paint. Since I knew there were several coats of paint on it already, I just went right over the yellow with some Valspar Signature Aspen Gray Interior Semi-Gloss. In hind sight I wish I had talked to a painting expert before choosing Semi-Gloss paint. It looks great but even after a few weeks, it doesn't feel completely dry. I considered taking the advice of Young House Love for painting furniture and adding a coat of polyurethane but the Lowe's painting expert talked me out of it considering the type of paint I had already used. Oh well. It looks great and it'll do. If you're an amateur painter like me, you might want to get some great advice for a painter who knows a thing or two. After I had painted it I shopped for knobs and went straight to Anthropologie for inspiration. I purchased six different knobs less than $10 each and came home to try them out. I had intended to just look at them and then try to find something similar for less online (possibly from this resource). However, after much deliberation and seeing that these amazing knobs were on sale at Anthropologie, I just decided to buy them. The price was even cheaper than some at Home Depot! They look amazing and I love the inlaid mother of pearl. I'm such a fancy pants! So, here she is! Isn't she pretty? Wow! I cannot believe what a great eye you have for decor and doing it yourself! This looks awesome! What a fantastic job! The knobs and paint job set it off so well in the living room. Love reading your blog! I LOVE it!! What a beautiful piece of furniture!! It's really pretty Liz! Where do you have room to paint such a big item? Wooooow! How did you know how to do that??? That looks great!! Thanks for sharing the process, it gave me hope to (maybe) tackle a project like that... maybe. What an awesome color and great knobs! Seriously, those knobs couldn't look any better on there - can't believe they were cheaper than some HD pieces. Great job! What a find! Love it. What a find, I need to start searching on Craigslist more. Our San Diego CL can be a good one! It's absolutely beautiful! Very well done. I love this kind of project. I spend an obscene amount of time on craigslist, but it always pays off! love the color! and the knobs are just beautiful... great job!